In the second games of the @EuroLeague Playoffs 2018, Olympiacos won Žalgiris with a score of 79 – 68, and now, in Kaunas, this Playoff is back to beginning. In the second game Fenerbahçe won by 95 – 89 against Baskonia and now has a match point. In Athens, Olympiacos managed to win in the second game against the Lithuanian team and made this Playoff more interesting. Now both teams are moving to Kaunas, where the home court advantage will belong to Žalgiris, but both teams showed that they won’t give up easily on the fight for a spot in the @EuroLeague Final Four 2018. The game was tied from the beginning, and after the 3rd quarter the result was 54 – 54, but in the last part of the game the home team used their previous experience in playing important games and with the help from the crowd didn’t let any major surprise and celebrated at the end. The score in the fourth quarter was 25 – 14 for a final result of 79 – 68. Olympiacos manged to overcome the fact that one of their important players is injured. 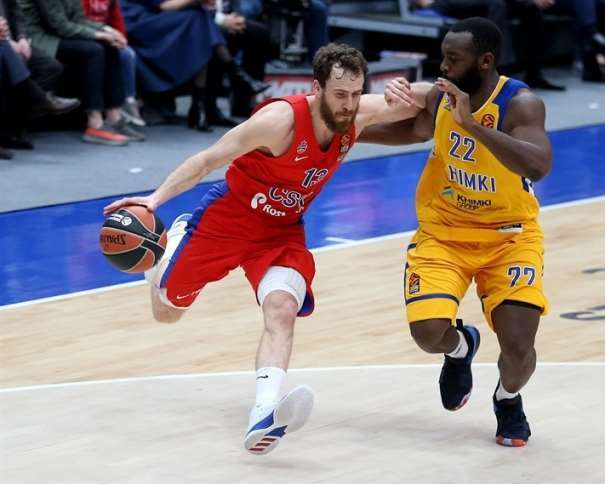 Nikola Milutinov will probably miss this Playoff due to a knee injurie. He was injured during the game one, and, even though, he continued playing, knee swelled up, and now it is expected that the Serbian centre will be sidelined for 10 days. Also, Georgios Bogris has knee problems and he will be out of action for about one month. These injurie problems didn’t stop the team from Athens to tie this Playoff. Jamel McLean took the enhanced role due to Milutinov’s injurie and led the scoring with 21 points, while Vassilis Spanoulis added 17. A solid game had also Ioannis Papapetrou, who finished the match with 9 points and 7 rebounds. In Žalgiris, Brandon Davies scored 20 points; Vasilije Micić, 13 and 8 assists; while Arturas Milaknis added 11. But that was apparently not enough for the visiting team to steal another victory, and maybe the main reason was an excellent home team defense. Olympiacos forced Šarūnas Jasikevičius’s team into 15 turnovers and only allowed them 11 three-point attempts. 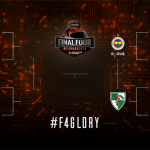 While in Athens the result after 2 matches is 1 – 1, in Istanbul there is a totally different situation: Fener is one step away from a spot in the Final 4 that will take place in Belgrade, Serbia. 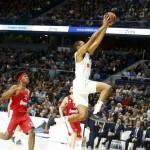 The Turkish team won against Baskonia and in Vitoria will have a chance in the first game to book the ticket for the Final of the tournament. 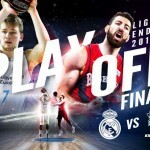 But the job won’t be easy, because now the host team will be Baskonia and maybe in front of their own crowd they will have a better chance and try to turn this Playoff in some other direction. 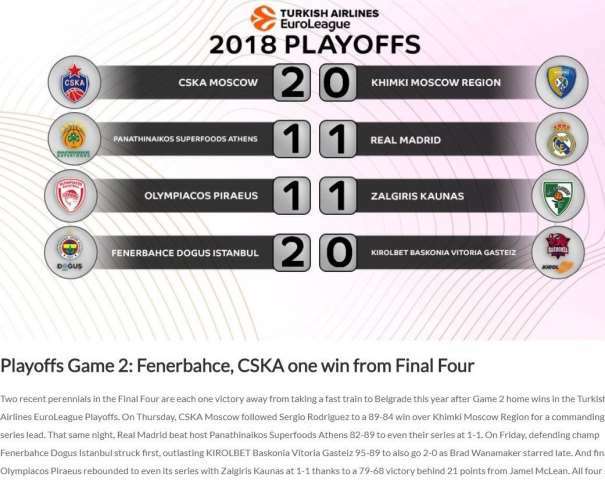 The fans in Istanbul were able to see that the guest team (Baskonia) simply refused to give up, but the home team had all the answers in offense and maybe that was the main reason Želimir Obradović’s team celebrated at the end. Matt Janning was the far best in Pedro Martinez’s team with 17 points. His teammate Vincent Poirier added 14, Tornike Shengelia scored 12 while three players finished the game with 11 points each: Janis Timma, Rodrigue Beaubois and Johannes Voigtmann. For the home team, 19 points were made by Brad Wanamaker, 16 by Jan Vesely and 11 by Nikola Kalinić. Two players were also with double digits score: Italians Nicolo Melli and Luigi Datome who, both, added 10 points to the scoring chart.